Here is a great Saga Saga that you'll surely enjoy. What we have here is an Adobe PDF file which lays out the building process of a very cool Saga Bass in great detail. Love the Guitarattack.com site! It prompted me to try something I have been meaning to do for some time now: build a guitar (or in this case, a Saga bass kit) I have been documenting it as I go along by taking lots of pictures and I hope to have it done soon. 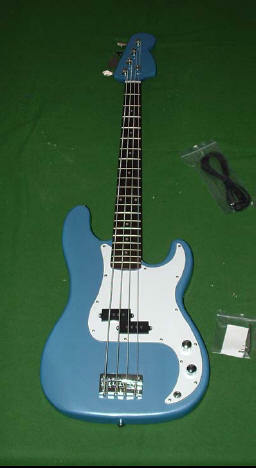 I looks to be the first submission to your site for a bass guitar. We recommend you right click on the link and save the file to your hard drive, then open it from there. It is under 1 meg, and should download quickly. Right click here to get the file.